The 2016 Ford Explorer gets new technology, refreshed styling, and numerous other refinements that should prompt a close look by SUV buyers. The 2016 ford explorer electric vehicle qualifies for a federal tax credit of up to $7,500, effectively reducing the net base price. 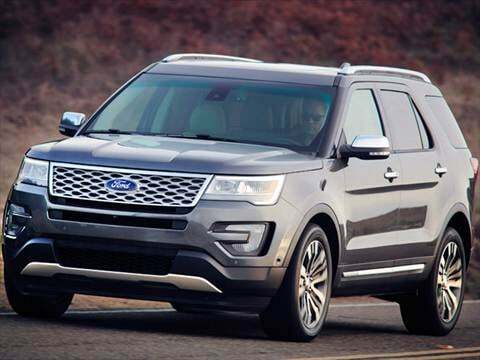 The 2016 Explorer brings new looks, new technology, and new thinking to Ford's ubiquitous midsize SUV. The refreshed exterior borrows from Land Rover's styling, and the new interior brings more refinements and ease of use, especially for shorter buyers, or those put off by Ford's touch-sensitive control interfaces and earlier versions of MyFord Touch. A new Explorer Platinum model offers luxury features like a twin-turbocharged V6 engine, leather-wrapped instrument panel, and "Nirvana" leather on the seats (no, it's not embroidered with heart-shaped boxes). Not all the changes are at the top though. A new 2.3-liter EcoBoost 4-cylinder engine offers more power and good fuel economy, and is now available with all-wheel drive. The Terrain Management System even gives this car-based crossover some off-road chops. The changes Ford made to the new Explorer SUV target those who were turned off by the control interface, who wanted more technology, and even shorter drivers, thanks to redesigned armrests. If you rejected the Ford Explorer for any of those reasons, maybe it's time for another look. While the new front-view camera and front parking sensors surely help maneuvering in parking lots, there's no question that the new Ford Explorer is still a big beast, and could be unwieldy. Another drawback: While the Terrain Management System is good, it can't match something like a Jeep Grand Cherokee. Numerous changes greet the 2016 Ford Explorer, including new exterior styling, a new interior, improved control interface with hard buttons replacing the touch-sensitive targets from last year, and a new 2.3-liter turbocharged EcoBoost 4-cylinder with 270 horsepower. Last but not least, there's a new luxurious model, the new Explorer Platinum. Two engines are carryover for the 2016 Ford Explorer: the standard 3.5-liter V6 continues, offering 290 horsepower with either front-wheel drive (FWD) or 4-wheel drive (AWD), and routing it through the 6-speed automatic transmission that's the only choice for all Explorer buyers. If you want real oomph, then the Explorer Sport and new Explorer Platinum offer a twin-turbocharged version of the V6 with 365 horsepower. However, the new 2.3-liter EcoBoost 4-cylinder engine that's available in base, XLT and Limited models caught our attention. Ford says it will offer the same fuel economy as last year's 2.0-liter version, but with 270 horsepower, it's nearly as powerful as the standard V6 and should have no problem hauling this big SUV around. It may sound odd to get excited over buttons, but we couldn't be happier that Ford has abandoned its touch-sensitive control panel with one that uses regular ol' buttons for climate controls and basic audio functions. We're not luddites, but the old system smacked of being different just for difference's sake. Once upon a time, SUVs were based off rugged 4-wheel-drive trucks. These days, they're mostly based on unibody car platforms, which are less robust. The Ford Explorer's Terrain Management System tries to bridge that gap by optimizing the Explorer's 4-wheel-drive system for snow, mud, or ruts with the twist of a dial. The Ford Explorer seats up to seven in its three rows, and thanks to its overall size even the third row offers room for adults. The second row comes as either a 3-person bench, or it can be had with two bucket seats. Fold both seating rows and you have generous cargo space. We're happy that Ford has replaced the old Explorer's touch-sensitive controls with actual buttons, and also like the looks of the new 10-inch digital screen integrated into the gauges. Other improvements are aimed at making the new Explorer friendlier to smaller drivers, such as repositioned armrests. The changes to the new Ford Explorer don't alter the basic silhouette of the SUV, but the details are quite nice. The new standard LED low-beam headlights, grille, and bumper in front give this mainstream SUV a first-glance resemblance to a Land Rover Range Rover, pretty good company we'd say, although the lower part of the bumper looks too heavy. We like the addition of a front-view camera on the Explorer, as well as front parking sensors, both handy when maneuvering through a parking lot. Changes to the rear are more subtle, and mostly consist of new taillights. The 2016 Explorer comes in five models: base, XLT, Limited, Sport, and a new Platinum model. Base models come standard with the 3.5-liter V6 engine, a 6-speed automatic with steering wheel-mounted paddle shifters, LED low-beam headlights and LED taillights, 18-inch wheels, and a rearview camera that incorporates a washer to keep the lens clean. Other standard features include cruise control, air conditioning, a 6-speaker audio system, and Ford's Sync. Ford's MyKey, allows drivers to program top speed and other parameters to help prevent young drivers from behaving recklessly. Other safety features include trailer Sway Control for easier towing. As is often the case these days, moving up through the model lineup is the best way to get more on your new Explorer. The mid-level XLT is a good value, offering leather seats, navigation, blind-spot detection, inflatable rear seatbelts, dual-zone automatic climate control, and a dual-panel moonroof. Base, XLT and Limited models can substitute the new 2.3-liter EcoBoost 4-cylinder for the standard V6, and all-wheel drive is available across the board, regardless of engine. The new Platinum model comes with the twin-turbo EcoBoost V6, plus high-end leather, a premium audio system, leather-covered dash, and other luxury items. The standard 290-horsepower 3.5-liter V6 on the Ford Explorer is fine for most people, offering decent power and acceptable fuel economy. The new 2.3-liter 4-cylinder engine makes a good argument for itself though. Despite being a little down on power compared to the V6, the EcoBoost four offers notably more torque, and can now be had with all-wheel drive. We expect this engine to be the choice for many buyers. Available on the Sport and Platinum models is the twin-turbocharged EcoBoost V6, bumping power up to a more-than-adequate 365 horsepower. All new Ford Explorer models can be equipped with 4-wheel drive, a change from last year. Additionally, all models use a 6-speed automatic transmission, now available with paddle shifters on the steering wheel. Prices for the 2016 Ford Explorer starts at about $31,500 for a front-wheel-drive base model with the standard V6 engine. The new 4-cylinder engine adds $995 to that total, while the 4-wheel-drive system tacks on $2,000. Considering the wider variety of options available, we think the XLT is a better entry point, at its base price of about $34,300. If you're looking for more power, the Sport and Platinum models start at $44,200 and $53,500, respectively. That's competitive with SUVs like the Nissan Pathfinder, Toyota Highlander and Honda Pilot, although the Hyundai Santa Fe starts below $30,000. The KBB.com Fair Purchase Price helps you get a good deal by telling you what other Explorer buyers in your area paid. Note that the Explorer's resale value holds up better than the Dodge Durango, and is right in line with the Chevrolet Traverse and Pilot, even if it's less than the Highlander. Best Explorer Ever . . . This car is a work horse. Purchased for travel and it is a dream perfect suv.